The recent and long anticipated announcement by Florida’s Governor Rick Scott about the forthcoming construction of Klausner’s 700 MMBft/year sawmill in Suwannee County, Florida is the second of Klausner’s recently announced mills in the US South. Another confirmed location, in Halifax County North Carolina was announced in late December by the state’s Governor Bev Perdue. At this time it is unknown whether the third potential site, near Orangeburg, South Carolina will go ahead. While the confirmed (and one proposed) state-of-the-art lumber mills in the Southern states add to the excitement of economic recovery (just look at the recent housing starts) and prospective employment in Halifax and Suwanee Counties, we at the Center wanted to run a quick wood demand in the wood basins of the three facilities. 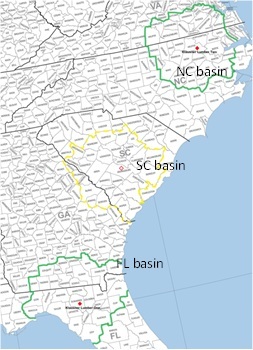 First, we designated an 85-mile radius around confirmed or potential mill locations in North Carolina, Florida and South Carolina (see map to the right). Next, a historic wood consumption report was run using Wood Demand data. And finally, incremental wood consumption for each Klausner’s mill was estimated using public information about proposed maximum lumber capacity, average effective capacity utilization in the region and an assumption about log-to-lumber yield. The resulting comparative analysis would outline the relative impact of additional timber demand from each new facility in the corresponding wood basin on total basin timber demand. Florida basin. Wood demand for pine grade timber declined 37.2% between 2006 and 2012. For the past 12 months demand in the basin was mostly flat, and in Q3 2012 it reached its lowest level in the past 6 years. 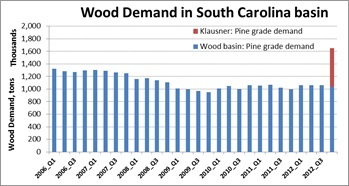 A new Klausner lumber mill can potentially add 61% to pine grade demand in the basin, pushing demand up to the top of 2006. The timber stumpage-demand relationship for the basin is close to unity, suggesting that additional demand, when realized and everything being equal may push stumpage prices to 2006-levels. However, we think that it is unlikely, as 6 years of declining demand in the basin (and outside) have substantially changed timber supply and, as a result, will likely lead to a smaller than historical impact on stumpage prices. North Carolina Basin. Wood Demand for pine grade declined 32% in the basin between 2006 and 2012. Wood demand reached its lowest point in Q4 2009 and since then has been slowly rising for the past 3 years. 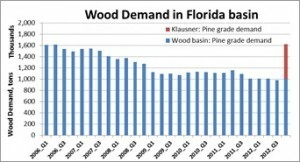 A new Klausner lumber mill can potentially add 50% to pine grade demand in the basin, pushing demand up slightly past the top of 2006. 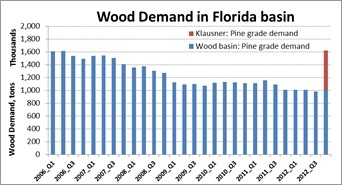 The timber stumpage-demand relationship for the basin is ~30% below that in the Florida basin, suggesting that additional demand, when realized and all else constant, may push stumpage prices to just below 2006-levels. However, we think that similar to Florida basin it is unlikely, as 6 years of declining demand in the basin (and outside) have changed timber supply in the basin and will likely lead to a smaller than historical impact on stumpage prices. 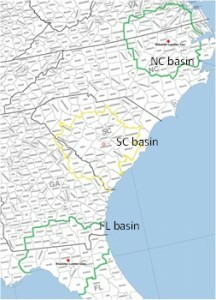 South Carolina basin. The basin is hypothetical as no official confirmation about a mill location has been received. The basin is the smallest of the three by size, and historically has been the least impacted by the recent recession. Wood Demand for pine grade declined 22% in the basin between 2006 and 2012. Wood demand reached its lowest point in Q4 2009 and since then has been very slowly rising for the past 3 years. 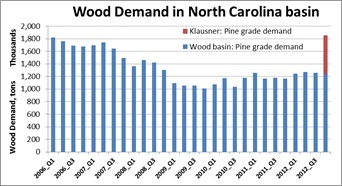 A new Klausner lumber mill can potentially add 60% to pine grade demand in the basin, pushing demand way past the top of 2006. The timber stumpage-demand relationship for the basin is ~55% below that in Florida basin, suggesting that additional demand, when realized and nothing else changed, may have relatively limited impact on stumpage prices. The stumpage price impact may be further mitigated by additional supply that has been preserved due to postponed harvests and lower demand in the past 6 years. Bottom line. 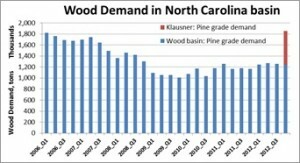 New mills in Florida and North Carolina basins and potentially in SC will have substantial impact on wood demand of pine grade and will likely lift stumpage prices in respective basins. 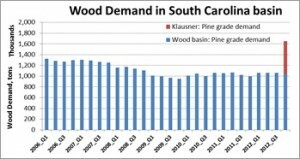 Pine sawtimber stumpage impact from demand fluctuation historically was the highest in Florida and the lowest in South Carolina basins. Stumpage price impact, when facilities open, will be mitigated by an increased supply of pine grade timber. Supply of pine grade has increased in the basin and in the region due to the prolonged decline of timber demand and postponed harvests in the region. Wood Demand Research Program, Center for Forest Business. We assume that each location will have a reported maximum of 700 MMBft/year capacity. Wood Demand Report, Q4 2012. Center for Forest Business. We assumed a yield of 4.5 tons/MBf of lumber produced. Pine grade includes pine sawtimber, pine chip-n-saw and pine plywood. Stumpage prices – Timber Mart-South, area-weighted prices based on the overlap with the basin.